As I told you a few days ago, I was invited to a dinner party at the Soho House New York, organized by Bib & Tuck Forward Fashion Project. It was my first invitation that I could attend since I had my blog. I had the pleasure to see and meet bloggers as Alicia Lund from Cheetah is the new black and Christine from My style pill and also stand at the table with Danielle Snyder, Co -founder, Dannijo, Liz Doupnik ,Fashion Editor StyleCaster, Jordan Potter, Public Relations Yigal Azrouel , Farryn Weiner , Director of Social Media Michael Kors and many more... Unfortunately I could't take any photos because of the low light, but I have a promise from a lovely photographer that I will receive some photos from the event and I will make a post with it . The blue looks great on you. Your hair looks amazing here – loving the color of that bag and the texture on this dress…stunning! You look great, the dress is really chic and I love the way you paired it with animal print shoes! However, love your hair this way! You looked magnificent in that (simple) Chic dress!!!! !Great combo with the shoes and bag!! amazing style! super dress and your hair is really nice! I AM SURE YOU TURNED A OT OF HEADS AND IMPRESSED…YOU LOOK BEAUTIFUL AND I LOVE THE DRESS, HAIR AND THE HEELS ARE KILLER..LOVE THE HEEL! I never would have thought to do leopard pumps with that color dress but it’s cute and fresh! Wow! What an opportunity! Hope you had a wonderful time. The dress is so gorgeous and very 70th. I am sure you were the most pretty and stylish girl at that event! Congratulations for the invitation to the event. I love your dress. This kind of dress is perfect for a party, for a walk or more ocassions. I adore these dresses. Such a cute look! 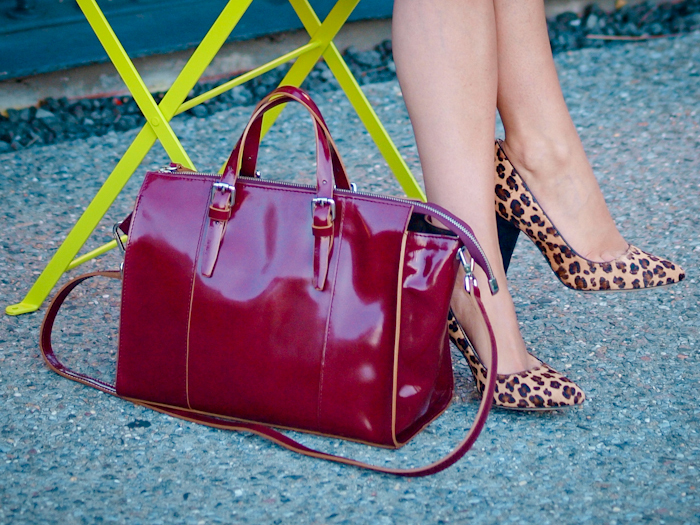 Love how you added the leopard pump! That dress looks fabulous on you and so reminds me of a dress my mother made for us (3 sisters dressing the same) in the 70’s ours was in pink, I am sure I would have loved this color even more!! Glad you had such a great opportunity and that you had fun can’t wait to see the photos of the even as well. I love this outfit! In the last few pictures, the lighting made it look ombre; so amazing. You look gorgeous! The hair down is such a good look for you. Veronica, you look absolutely wonderful, utmost stylish as always! blue really suits you!And you definitely should wear your hair like this more often. So pretty! Your dress is so pretty. It’s a beautiful color. I really love your bag too. Love your plum bag against the blue dress. hope you had great evening dear! lovely look! baby blue is def your color sweety!! Love the fit of the dress and how beautifully elegant you look in it!! Gorgeous girl, I can’t remember the last time I saw your hair curly/wavy, LOVE it! Plus this shade is stunning on you. Gorgeous frock too! You are so lucky!! And you look so pretty!! ps: esti pe culmile gloriei, exact acolo unde iti este locul. I think a lot of people would have walked by this dress, but you knew just how great it could be. Bravo indeed!